Bus accidents can cause serious injuries due to their large size, lack of seat belts, and rollover potential. The Foley Law Firm pursues maximum financial recovery for their clients by going after large bus companies and their insurers. If you or a loved one has been in a bus accident, contact a Scranton, PA, bus accident attorney with experience fighting for the rights of people who have been hurt by others' negligence. Because of their lack of seat belts and other protective measures, injuries sustained in a bus accident can often require a lifetime of care. What Types Of Injuries Are Likely In A Bus Accident? In the most severe accident, wrongful death is also possible. The size and weight of a bus make it more prone to rollover, and the force at impact can be so great that a passenger might be thrown from the bus and suffer life-ending injuries. A bus accident attorney familiar with the unique nature of a bus accident is in the best position to demand fair compensation when you are hurt in a bus accident. The decision to take the bus can also be a decision to put your safety in the hands of a large company or motor vehicle carrier. Most buses are either privately owned or operated by a local governmental agency. The issue of insurance becomes complicated when dealing with large motor carrier companies, and the same is true when the responsible entity is part of the government. Specialized processes and procedures must be followed when making a claim against a private company or government agency operating a bus, but that does not mean your efforts will not be successful. With the right bus accident attorney by your side, your claim will be filed purposefully and with one goal in mind; to obtain the maximum compensation to which you are entitled. Public buses and school buses are great ways to get from point A to point B when you do not have a personal car or need help getting the kids to and from school, but they lack basic safety features that make being in a bus accident a potentially devastating experience. Buses do not have seat belts or airbags and are larger than passenger vehicles. This combination can be deadly in the event of an accident, with a high risk for rollover. Even if a bus does not roll over when involved in an accident, the impact is still likely to be great and the injuries suffered severe. Victims of bus accidents are entitled to seek payment for all of their injuries and every damage suffered as a result of the accident. Damages available for these injuries include medical expenses, pain and suffering, lost wages, and wrongful death benefits. 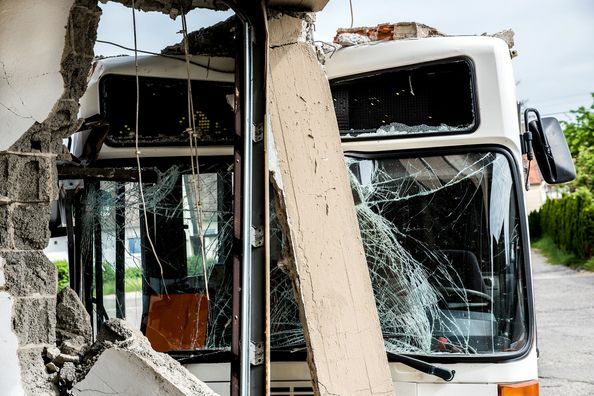 If you have been in a bus accident or lost a loved one to this type of catastrophe, let us help. We have the experience you need to demand maximum reimbursement for all of your injuries. To schedule an initial office consultation, you can either contact us online or call us at (800) 523-6539.